Adult male in alternate plumage is unmistakable. 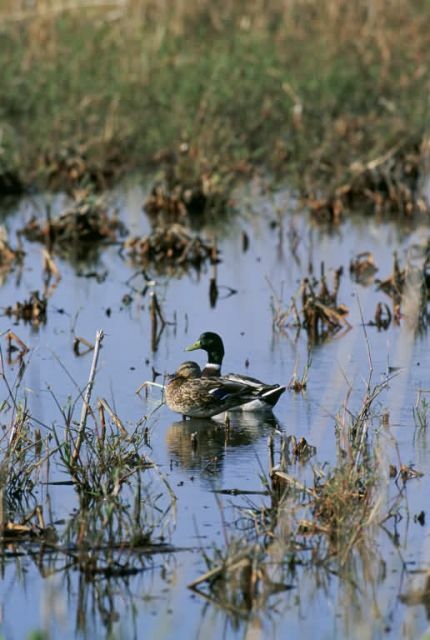 Females, immature and eclipse-plumage males could be confused with Black Ducks, Gadwalls and Mottled Ducks, but note the blue speculum with white borders on both sides. Gadwalls are also distinctive in their steeper forehead, gray bill with orange edges and white belly patch. Hybrid Mallard x Black Ducks are often seen and are darker than Mallards, with a more purple speculum bordered by white on one or both edges and usually show some traces of the Mallard plumage.